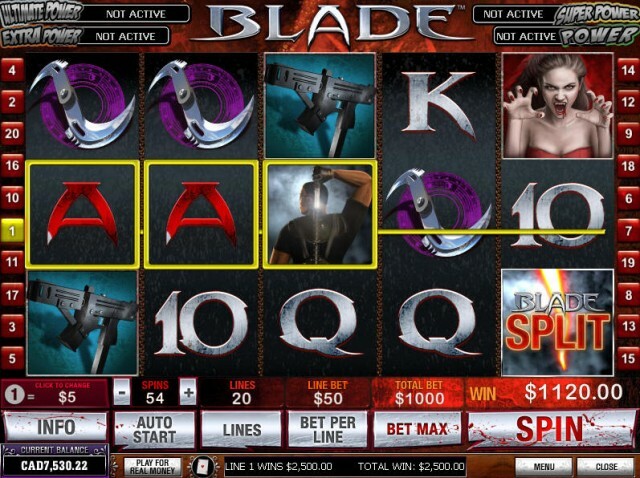 Blade is a 5-Reel 9-Payline Video Slots game based on the Classic Marvel Comics character. The comic was also the inspiration for the movie of the same name Blade. This Slots game is provided by Cryptologic and is a part of the Marvel Theme Based Slots. Play the Blade slot at William Hill. The symbols of the reel are like real Blade characters with a compelling background sound. It is very easy to identify with the graphics of the game for the fans of the comic book series. The symbols are like Guns, Cross, A Grave signboard and Knives among others. The Blade character symbol is a substitute symbol and which is combined along with a Vampire Symbol initiates a Bonus feature of the game. The Blade Logo appears as a Scatter Symbol. The sounds of the games are like swords clashing and other weapons making different but interesting voice. The game is a Progressive Jackpot offering three different value Pots for the players to increase there winnings. Also, the Jackpots are independent and not based on the outcome of the game. The Bonus Games offers Free Spins to give additional winning opportunities. The symbol of the Blade if appears on any of the Reels acts like a Wild or Substitute Symbol to form the winning combination. It can replace all the symbols except the Blade Logo which is the Scatter Symbol. The Blade slot game contains both wild and scatter symbols to give players extra winning opportunities. The Blade Logo features as a Scatter Symbol in the game. Two or more than two of the Scatter Symbol on any of the 5 Reels gives a handsome payout. The Bonus Feature of the Game is Free Spins. To trigger the Bonus Free Spins, the Vampire Symbol needs to be present on Reel 1 and Reel 5 and the Blade Symbol on Reel 3. After that, the player gets 5 more Free Spins. The Blade Symbol is expanded on all the symbols of Reel 3 and on the other Reels the Vampire Symbol is replaced by Blade. The player increases the chances of winning on this Bonus Free Spins to a great extent. Blade is a part of Marvel Theme Based Slots and so offers the High Value Marvel Hero Jackpot to all the players. Besides this, there are two other Jackpots the players participate in. The Super Hero Jackpot offers a High Value Jackpot for the players of the Blade Video Slots game. There is also a high frequency Jackpot called the Hero Jackpot which pays every few hours. Intercasino Featuring Blade and all the Marvel Slots, Intercasino comes highly recommended. Casino Tropez has the latest version of Blade.